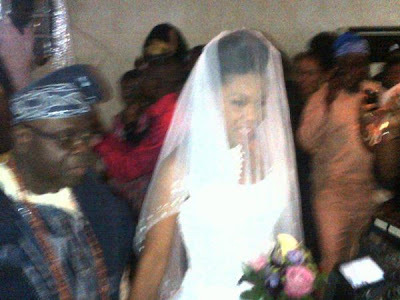 Popular dancer Kafayat Shefau popularly known as Kaffy got married to her fiance Joseph amey known as pappy J today June 2,2012 . A nikkai ceremony was held followed by the reception at bespoke Event Centre ,Lekki lagos. The ceremony was well attended by many celebrities.The couple has a son together. covering her face with veil after child birth is ungodly. 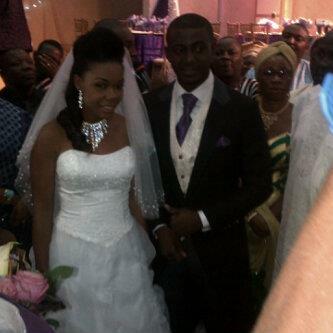 Lolss @ prevoius coments.....apy married life kaffy! Kaffy,congrats!pls,take good care of ur husbby O!!!!!! Bad. Bellezzzzzzzzz y dnt guys try nd b hapy for others. @least for onces. S̶̲̥̅Ơ̴̴̴̴̴̴͡ Δaτ̲̅ G̶̲̥̅Ơ̴̴̴̴͡.̮Ơ̴̴̴͡D̅ tinz can also come Ūя̲̅ way. Happy married life princess. Ūя̲̅ gown. Rocks!!!!!! !